I promised myself I wouldn’t write about my passport woes until they were over. So now I can finally say it’s done. I did a trip to Thailand for shopping (there’s a great market at Aranyapthe on the Thai side) a couple of weeks ago and I got my e-visa. A travel agent then sent my passport back to Phnom Penh for the six-month extension, so now it’s full steam ahead. The sun is shining and the birds are singing – even though they’re only sparrows, they’re apparently too hard to pluck, which helps with their survival. For some reason the border crossings really stress me out. Not that I have anything to hide. I empty my bags four or five times to make sure no-one has put anything in like a baby, drugs or an aircraft carrier. It’s good to relax and do some some-sightseeing to take your mind off all the stress. 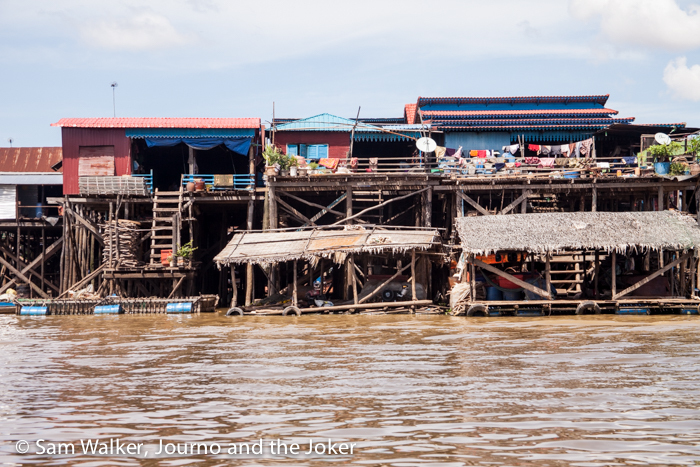 The Journo’s friend, Lisa, spent a couple of weeks here so we spent half a day out on a boat on Lake Tonle Sap, taking a look at the floating village and surrounding area. Although the lake had significantly more water in it than the last time we were there, it was nowhere near full, which we were hoping for. A poor wet season is to blame and evidence of this can be seen by the almost dry drainage ditches on the side of the road on the way out to the villages where we’ve been building houses. 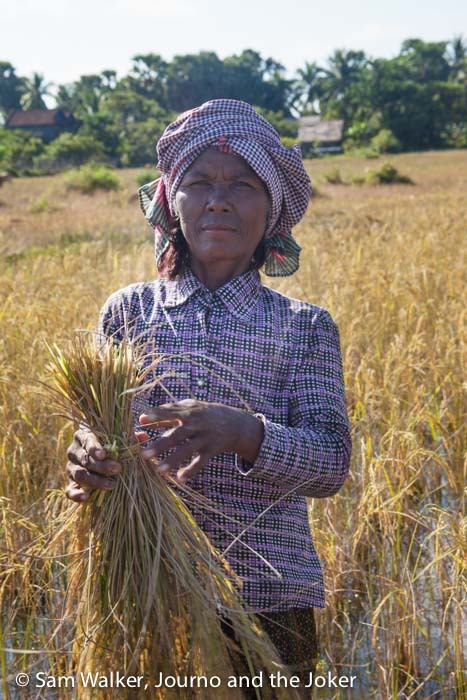 A poor wet season means a reduction in the quantity and quality of rice harvested. And harvesting seems to be happening now. It also means a rise in the purchase price of rice for the local people, whose crops may not get them through to next year. 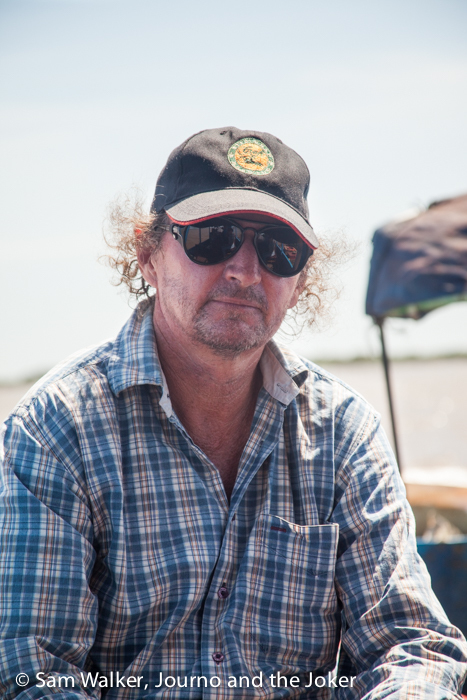 I was also talking to our favourite tuk tuk driver ,w ho had just been out to the bird sanctuary on the top end of Tonle Sap and he confirmed the lack of water made access difficult for the bird watchers and there are less birds than usual. It’s quite an expensive day trip so visiting might not remain on our list of things to do while we’re here. Last week was Bon Om Touk, the Khmer water festival, which attracted thousands of people from around Siem Reap and some from Phnom Penh because the festival there was cancelled, apparently because of lack of water. The carnival atmosphere reverberated here for around a full week, although it’s only a three-day festival. But it was plenty of fun with longboat racing and street stalls and all the good things that go with this sort of festivity. 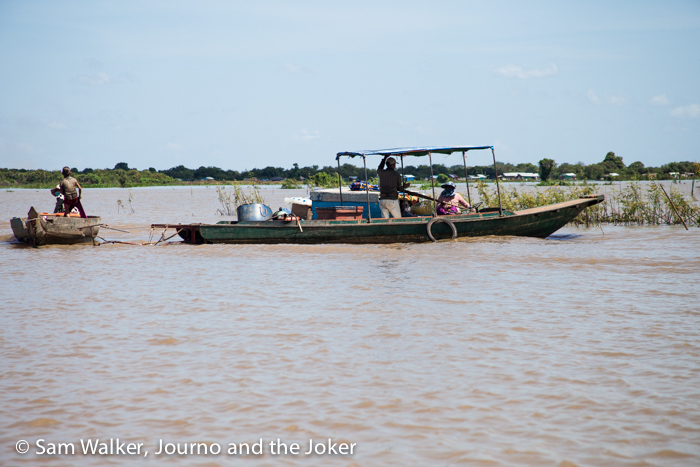 I’m not sure about the tractors for sale but hey, it’s Cambodia and it is a water festival, so just go with the flow. Will be good to see you. Hopefully not as hot as last time you were here but “winter” seems to be in no hurry to arrive.